This pale golden tequila is produced from 100% blue agave in the heart of Mexico's Jalisco region and aged in oak for two months. It is light gold in colour and has an attractive caramel aroma. The taste is peppery and rounded with a touch of cinnamon, and it's delicious sipped alongside poultry dishes. 100% blue agave. Hand-harvested. Kosher - KA Pareve. 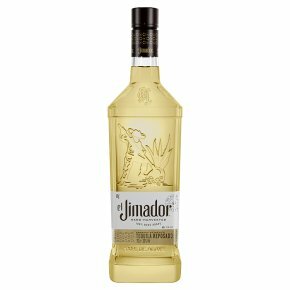 100% Real Premium Tequila el Jimador is handcrafted at the legendary Casa Herradura estate located in the heart of Jalisco, Mexico. Every drop of our tequila is made from 100% blue agave, delivering a smooth and balanced flavour, which has made it the number one 100% agave tequila in Mexico*. el Jimador Reposado is handcrafted via our proprietary production process and aged for two months in American oak barrels. The result is an exquisite golden colour, perfectly balanced flavours and an unusually smooth and mellow character. ?Jimador? is the name given to the skilled harvesters of the blue agave plant from which tequila is made and we proudly honour him with our name. 100% Estate Bottled. 100% Blue Agave. 100% Natural.